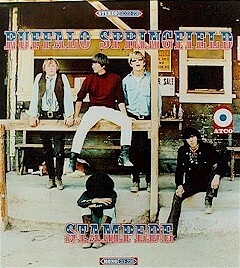 There are many songs that are often cited by Buffalo Springfield afficinados as proposed tracks for an album called "Stampede" which was rumoured for release in the spring of 1967. The story of this album, much like the Beach Boys legendary "Smile" album, has grown to near mythic proportions over the decades with amateur musicologists pouring over the song lists and speculating on possible tracks. Though Atco records had a follow up album , to Buffalo Springfield, in mind and assigned a catalogue number to the anticipated album, going as far as to print up a record cover, there was, in fact, no "Stampede" album ever planned by the group themselves. True, they were recording that spring, albiet sporadically with or without several members, but not with the specific goal in mind of a definite album. "At the time, recording was a way of killing time while we figured out what to do, " offers Richie Furay. "For What It's Worth was still climbing, but we didn't have Bruce (Palmer), so we had to do something. We had alot of songs and there was alot of experimenting with other musicians that all started then. It was, 'Let's not tell Dewey(Martin)' or 'Let's use Bobby West.' It was probably a way of biding our time until the lineup sorted out. We had some gigs to fill but we didn't have a major tour bookied." Confirms Richie, " There wasn't a "Stampede" album but a cover photo was shot for a follow up album. The cuts that are attributed to a "Stampede" album were just tracks we had cut or going to be cut over several month." In the 1970's, a well circulated "Stampede" bootleg (again like "Smile") purporting to be the real thing was, inreality, merely composed of several outtakes from the debut album and New York sessions, two tracks entitled "Raga # 1" and "Raga # 2" comprised of aimless noodlings by Dewey, Neil, Stephen, Richie, and the Nitty Gritty Dirt Band's Bruce Kunkel, plus an obscure live recording dating from the summer of 1967 that does not include Neil. Nonetheless, Atco went ahead and printed up a sleeve using an existing photo shoot of the group up in the Hollywood Hills posed around a western corral. The less than flattering photo, minus Bruce with Dickie(Davis) seated out front, a large hat obscuring his face. Given the western motif and the group's name, Atco chose "Stampede" as the title, lettering in stars and stripes. Close to one hundred thousand of these sleeves were printed in anticipation of the album, only to be given away as promotional items later that fall after the official release of their second album, Buffalo Springfield Again, which was assigned the catalogue number originally intended for "Stampede", 33-226.